Drunk With A Pen started out as a book. It then evolved into a set of performance poems. It has since gone on to become a 4-star solo rated Fringe show. 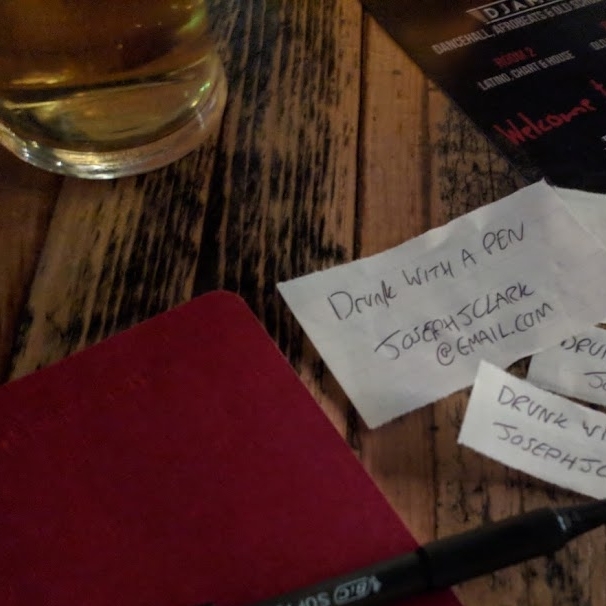 Joseph J. Clark’s ‘pub crawl of poems’ analogy was indeed what he set out for it to be; a simultaneous condemnation and celebration of the effects of drinking, starting pleasantly, getting a bit weepy in the middle and ending up joyfully singing to a lamp post. Clark commands attention from the get-go... an eloquent, talented performer and orator with some of his work demanding dynamic, linguistic gymnastics at times verging on rapping. This is performance poetry at its most accessible and is a bit like being in the pub with a more interesting raconteur then you can usually rustle up. It was raining. Hell, "raining" doesn't cover it. It was wet enough to drown a mermaid out there. A pretty girl tottering through all that weather was just about the last thing I expected to see. But there she was: cold, wet, and in a funk that would silence a banshee. She barely even sees me on the cart: it's not until I stand up to my towering two feet and two inches – never forget those two inches, Sheriff – and hollar at her that she gets her bearings. An autobiographical story about growing up with video games. After a long, long night on the Gin, Debs finds herself locked out of new home. Epistory - Typing Chronicles is a PC video game developed by Fishing Cactus. The story and script were written by Joseph J Clark. In Epistory, you play the role of the muse, guiding the heroine through the story - although not everything is at first seems. All exploration, interaction and combat take place by typing key words as prompted on the screen - mixing the mechanics of Typing of the Dead with Zelda to create an exciting and emotional adventure game. It really is a lovely thing...rising above its own gimmick to be a little bit special. And if the looks don’t persuade you than the brilliant soundtrack and voice narration will surely win you over. The main character is charming and the story is told in an engrossing manner. Algo Bot is a programming puzzle game by Fishing Cactus, available on PC. Follow the journey of Algo Bot on the colonisation ship Europa, solving fiendish puzzles as you move through the decks. Joseph J Clark designed the story and wrote the script. I also appreciate the gently mocking tone of the narrator bot, PAL, who appears to fall somewhere between Marvin the Paranoid Android and GlaDOS.